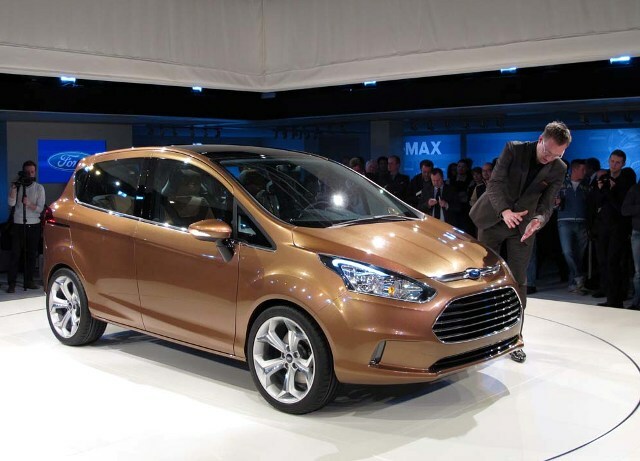 The much awaited MUV whiz, Ford B-Max was today unveiled in the 2012 Mobile World Congress at Barcelona. The company displayed the concept of this MPV aforetime at the 2010 Geneva Motor Show and the media sketches of this car were displayed earlier this month. Interestingly, for the first time a global automotive machine has been unwrapped at a technology fate. With the launch of this car, Ford has initiated for the amazing voice-activated in-car connectivity feature 'SYNC' in the European that was so far been used in the U.S auto market. This feature facilitates the driver to connect their mobile phones and music system without having any physically effort. Stephen Odell, Chairman and CEO of Ford Europe stated that the display of B-Max at the Mobile World Congress signifies the importance of technology to both the customers and the company. He added that this MPV would aim for higher goals of the small vehicles in the European region along with supreme technology and engineering. Ford B-Max would be power-trained by an all new 1.0-litre Ford EcoBoost inline, substituting the usual 1.4 liter and 1.6 liter engines. The efficient EcoBoost engine of this car is said to have potential to churn power of either 100 PS or 125 PS. Furthermore, the 1.6 liter Duratorq TDCi diesel engine will also accompany the B-Max fleet. This compact MUV lies on the B-platform that has also been used in other Ford vehicles like the Fiesta hatchback, Fiesta sedan and the much anticipated compact crossover, the EcoSport. Though the vehicle has got a lot of scope in the global automobile market, but at present, apart from Europe the company has stated to offer this car only in the Indian auto-market. On the Indian sub-continent, this car might have a rivalry action with another upcoming Maruti MPV, the Ertiga. Expectations are that Ford B-Max might be launched in the European sub-continent by the end of this year, while on the Indian shores this car is foreseen to be introduced by 2013.